A picture of Sofia 'reading' a book yesterday. The first of another 5 or 6 books (I lost count... Post pregnancy brain...). Ah anyhow. I wish I could blog about all her progress but you see, ah you know it is easier said than done. I stayed up late for a few nights to complete the post on Sofia's first group swimming lesson, and I got down with headache after that. I learned a lesson and decided whatever. If I'm healthy, I can care for Sofia better. Health comes first. Okay. 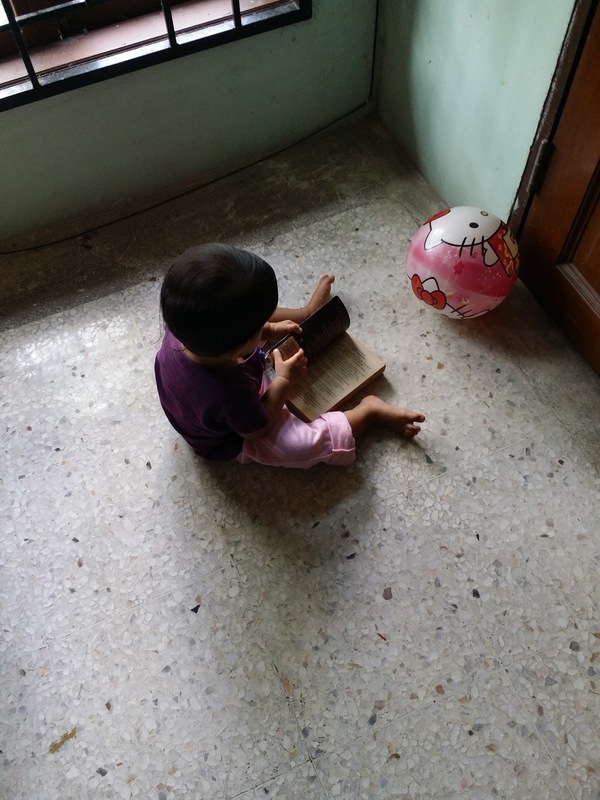 So, the book Sofia took was from our small home library upstairs. Had to go up 18 steps. Yes, I counted every time Sofia took a step. 9 steps. Walk a few steps, then another flight of steps. 9 and another 9. I used to not count, just say 'up' and 'good' but I read up an article that it is good to count while your child do something so that they know their progress. I also realized Sofia started to get more excited too. So should I say 'yeay!'??? More stairsss..... Huh. Anyhow, after 'reading' a few pages, she decided she wanted to take more books. She walked to the flight of stairs, leaving the book by the window. I was just testing, really. I told her, "Sofia, put back book" and guess what, she walked back towards the window, picked up the book and walked back towards the stairs. WOW. I was surprised. She is that smart oh. And so I thought, this is good. I should teach her to start putting things back to its place. HAHA. One parenting tip I read up is that parents have to be consistent in their rules and in what they said. CONSISTENCY. Another HAHA. If you're starting to get an idea of what happened later on, you are probably right. HAHA to me. Our small library is upstairs. 18 steps away, dude! And here's how it went for another 5 or 6 books. Assist Sofia walking up the stairs, take one book, carry her down the stairs. The second book she brought down, she flipped a few pages and decided okay, next book. The third book... She only flipped ONE page. And already wanted to go up. CONSISTENCY. I kept reminding myself, this is good for Sofia this is good for Sofia... I am teaching her good things. Belecak ketiak weh. And after all that, I thought she would nap longer. Ah mana. Only for 30 minutes. Anyhow, today I taught her to 'put back' again. Kurang sikit from yesterday. 4 books. mek pun akan count everything bila dengan anak. contohnya mandi, count to 10 dan siap. basuh tangan pun count, count to five dan siap. hahahaha. and yes, istiqamah tu memang susah bash. kadang naik minyak jugak. terlupa she just a kid, mane la tahu nak disiplin like elders. same la bash. berangan sangat tengok anak org behave je baca buku siap selek belek sekeping2, anak mak selak 1st page teros jump to last page. kadang selak 1st page, tutop teros. klw hard cover books tu, kdg kite br nk point kat pictures, die dah ttp, ngn tangan2 kite terkepit skali taw. saba je la..
as for mengajar adam to put thing back to its place, bash bayang kan eh.. sambil sya cakap "put back" tu, sambil tangan demo, mulot muncung, muke berkerot, pitching jgn cakap la. only the first round je suara cool. bile repeat, makin tinggi ppitching. Mek, bash dah start count (dengan hampir istiqamah) heheh dan Alhamdulillah nampaknya dia pun suka. And macam lebih disiplin gak sebenarnya. Sya... Sofia sekarang dah banyak improve 😊 Okayla dia dah mula selak satu satu and put back jugak buku. Rasanya berkesan la kut put back put back tu... hahahah. Boleh bayangkan sya. Puttttt (muncung) back!